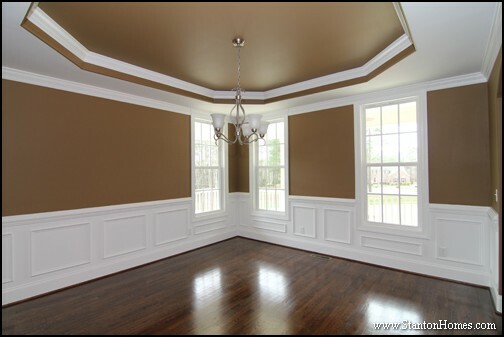 Wainscoting is a lower wall treatment that adds a more upscale, formal look to a room at minimal cost, with chair-rail molding, baseboard, and a series of trim pieces. 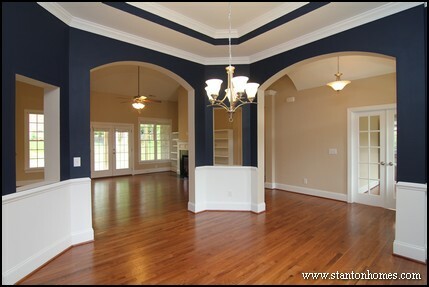 You'll most often find wainscoting in formal dining rooms, foyer entryways, hallways and powder rooms, but as you can see, creative designers can show you ways to add wainscoting details to kitchen islands, columns, and anywhere else you want to spotlight. 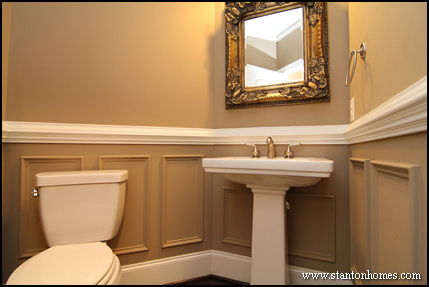 Gold painted picture frame wainscoting in the powder room - a space where you're not limited to "bland" designs! 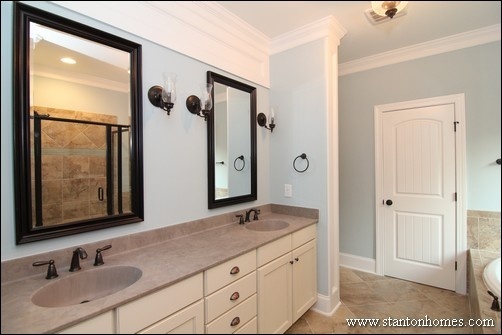 Wainscot accents in the master bathroom - see the header above the mirrors and column along the divider wall? 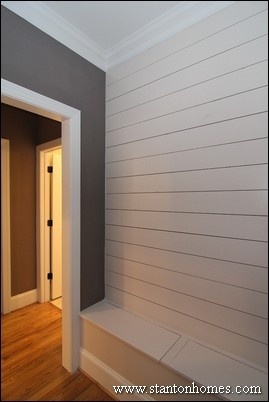 Well, shiplap is not technically wainscoting - but it's a popular trim style for new homes! 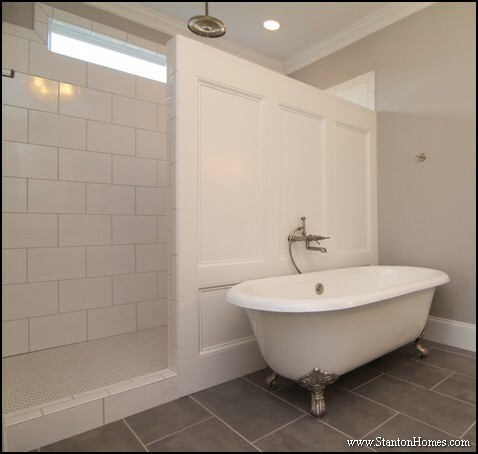 We've seen a lot of shiplap designs over fireplaces, in mud rooms (as a drop zone) and on an accent wall in the kitchen or master bedroom. 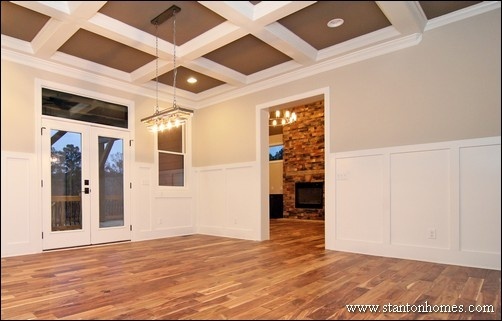 Whether you're in love with floor-to-ceiling wainscoting designs (like those we see in million dollar homes on Houzz) or subtle wainscot accents, these Stanton Homes will show you how to do wainscoting right - based on your floor plan and interior design must-haves. This fireplace is more than a centerpiece. It is grand, elegant, and able to compliment - rather than compete with - the huge arched windows and row of four glass french doors. 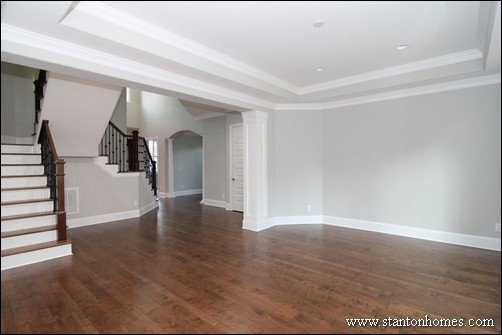 The expanded height of this room makes the wainscoting design flow perfectly, without digging into the second floor. 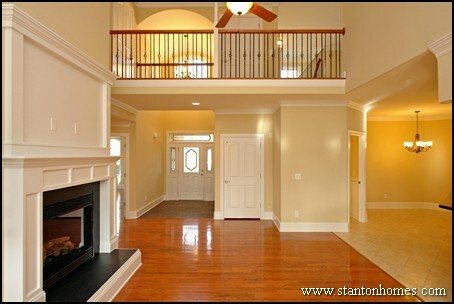 Love two story living rooms? 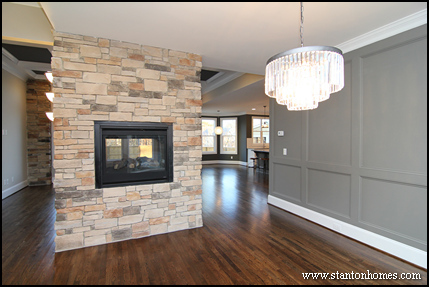 Wainscot paneling extends from the two-sided gas fireplace to the ceiling. 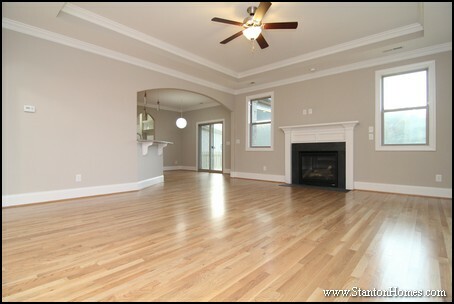 This living room is formal - with no space for the TV above the fireplace. 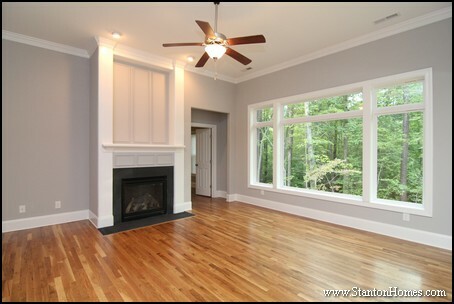 This fireplace design is very complex: floor-to-ceiling white columns frame the fireplace for a more blended interior wall location, the mantel breaks the wainscoting into two sections for greater depth, and the wainscot panels are painted a soft grey as an off-setting technique. This living room blends formality - with wainscot framing around the fireplace - and informality with built-in TV connections inside the paneling. 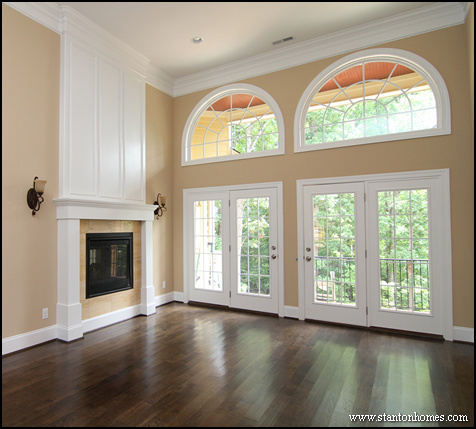 A solid pannel above the fireplace gives a more modern feel, contrasting against the rectangular pieces below. 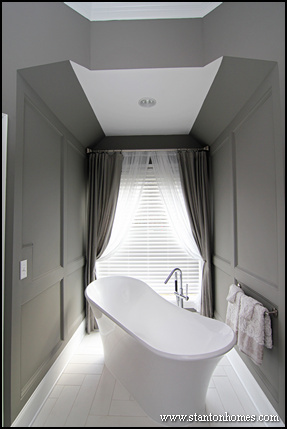 If you're looking for more subtle ways to add wainscoting, consider thinner accent panels. In this living room, a touch of wainscoting draws some white into the room, a bright accent against the grey walls and black fireplace. 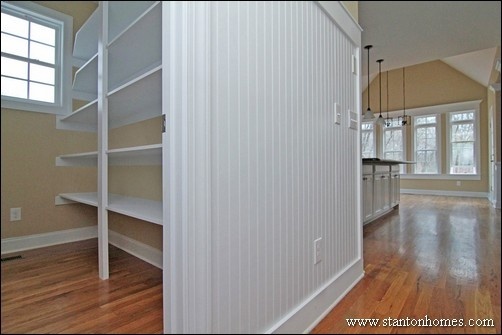 Sometimes, it just makes sense to add in a bit of wainscoting. 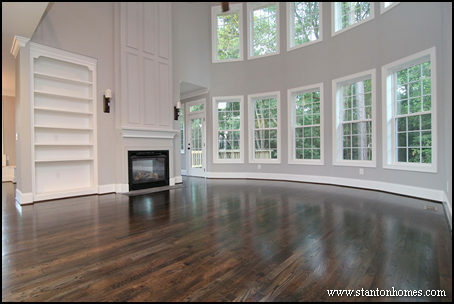 In this custom home living room, built in bookcases rest on each side of the fireplace. 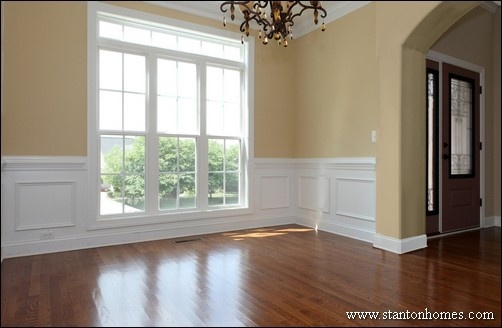 Wainscot paneling gives the fireplace more height, so that it balances out the centerpiece of the room. 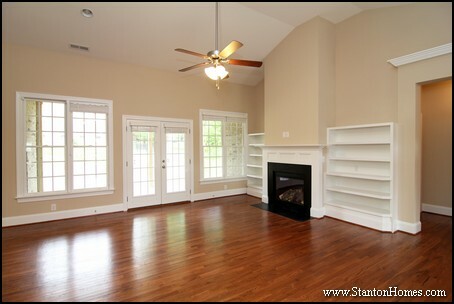 Otherwise, the bookcases would dominate the space. 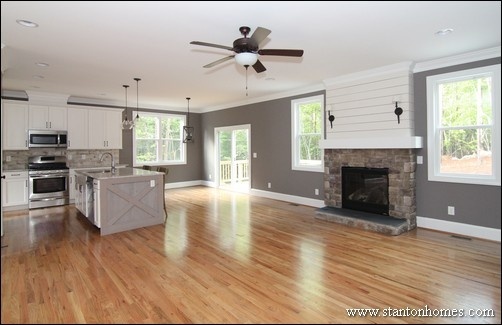 In this Raleigh new home, white paneling wraps the living room columns. The fireplace design incorporates white panels back into the room, for symmetry in design. 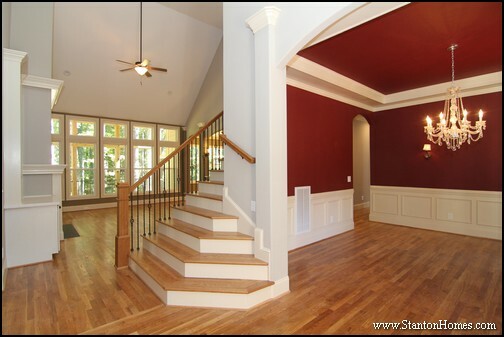 A well-known interior design trick is to carry a theme (a color, material, or feature) throughout your home. 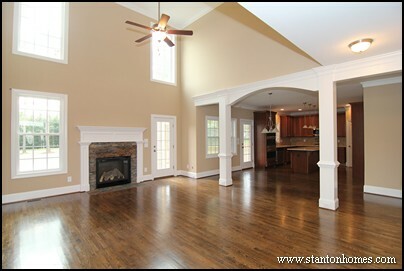 In this Chapel Hill custom home, the wainscoting above the fireplace mirrors the kitchen cabinetry design. 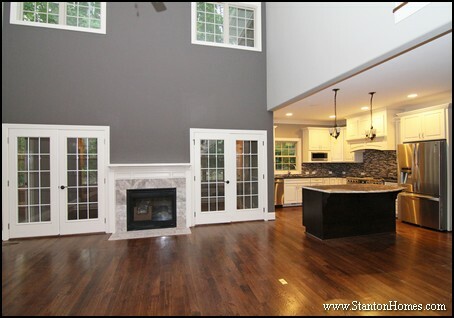 Check out the paneling above the gas range.